1991 RI Inspection - $20.00 : Bob Hoyts Classic Inspection Stickers, Add a Final Touch to your Restoration! 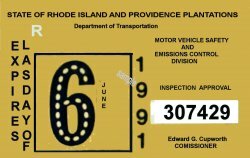 This 1989 Rhode Island Inspection sticker was issued in 1991 and expired on date given. It has been restored and reproduced in better condition than the original.